The biggest Santa Bar Crawl hits DC this December! THE CITY’S BIGGEST SANTA BAR CRAWL & EVENT! WASHINGTON, DC, November 8, 2012 – Project DC Events is excited to announce DC Santa Crawl 2012, scheduled for Saturday, December 8th from 2:00 PM until 9:00 PM. The winter/holiday celebration will feature a number of bars in Dupont Circle and the Golden Triangle, including BlackFinn, Bottom Line, Irish Whiskey, Public Bar, Mackeys, Lucky Bar, Rumors and The Mighty Pint, with more bars being added weekly. After registering to start the crawl, holiday crawlers will receive a refillable signature mug, a bar crawl map, and will enjoy free cover and exclusive drink specials at some of the hottest establishments DC has to offer! And the Summer Crawl DC 2012 raffle winners are..
Project DC Events would like to thank everyone that participated in the raffle and in the DC bar crawl. We hope you enjoyed the event as much as we did hosting it. We would also like to thank WAKA, Miller Lite, Bacardi, MD Beer Pong, 3 Pizanos and Snapshop Moments for sponsoring this awesome event, as well as our partner establishments: BlackFinn Saloon, The Bottom Line, The Mighty Pint, Public Bar and Irish Whiskey. With that said, here are the raffle winners. 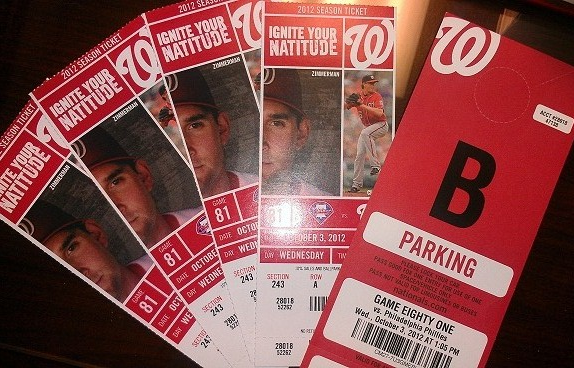 Project DC Events’ staff will contact you via e-mail/phone so that you’re able to receive your prize! Thanks again for making this DC bar crawl a successful one. All event photo’s will be posted on the site shortly. Don’t forget to: Like Project DC Events on Facebook and Follow Project DC Events on Twitter. Stayed tuned for upcoming events! 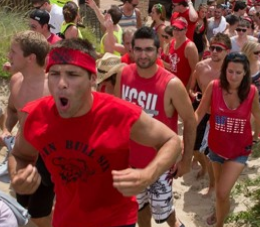 The weekend of September 22 marks the last weekend before the end of the summer, and that calls for only one thing – an end of the Summer bar crawl! Below you will find Summer Crawl DC’ crawl map. Plan accordingly, don’t get lost, have an awesome time, and most importantly, be safe! See you at the crawl! 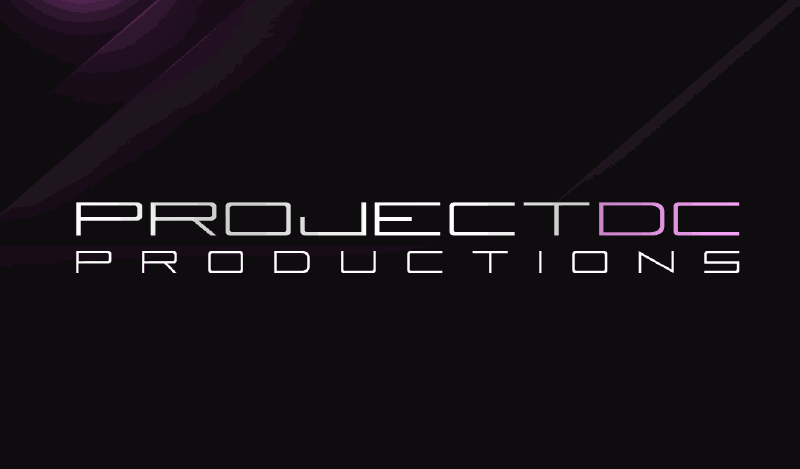 Project DC Events welcomes WAKA, Miller Lite and Bacardi as sponsors. ROCK YOUR BEACH GEAR ONE LAST TIME! WASHINGTON, DC, September 17, 2012 – Project DC Events is excited to announce Summer Crawl DC 2012’s official partners of the event, scheduled for Saturday, September 22nd from 2:00 PM until 9:00 PM. The end of summer celebration will feature a number of bars in Dupont Circle and the Golden Triangle, including BlackFinn, The Mighty Pint, Irish Whiskey, Public Bar, and more. After registering at BlackFinn to start the crawl, partygoers will enjoy free cover and drink and food specials at some of the hottest bars DC has to offer! For their inaugural day event, Project DC Events has partnered up with major local brands as well as a brands that are surely to make an impact in their industry in the next few months. Project DC would like to welcome: WAKA (World Adult Kickball Association), Bacardi, Miller Lite, 3 Pizanos, Snapshot Moments and Maryland Beer Pong. WAKA will also feature as the event’s platinum sponsor. If you follow trends, viral videos, and the next big hit when it comes to music and dance, you may have heard of of PSY’s – “Gangnam Style.” The video has been on YouTube for only 6 weeks and has well over 65 million views worldwide! I knew this song had the potential to go mainstream in America and the DC bars and clubs as soon as it was released; however, it wasn’t until this past weekend, when I attended the Redskins vs. Colts preseason game at FedEX Field (Hail! by the way) that I saw it performed live by some of the tailgating fans. 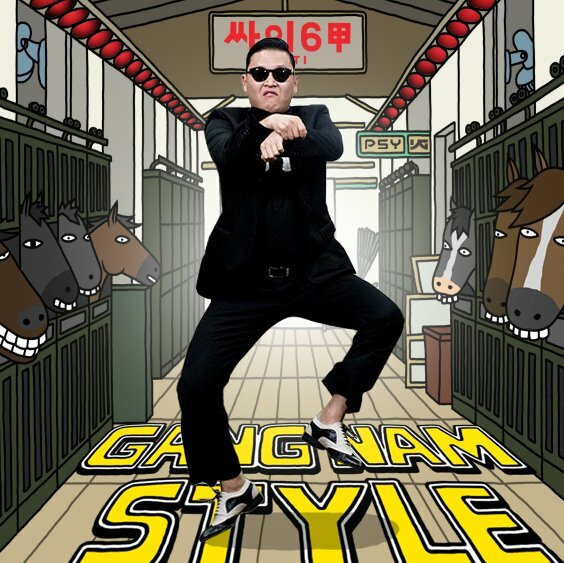 After asking friends if they had heard of the song, half of them replied with “I have heard it at the bars” or “I heard it when I was out.” At that moment I knew, “Gangnam Style” had landed in Washington DC. 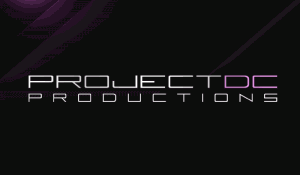 Project DC Events is a newly formed branch of Project DC Productions, DC’s premiere event planning and promotion company throwing the parties you want in the city you love. We are excited to announce this expansion into the bar market. We have had great success in the past in the bar arena and to due to such high demand we have formed Project DC Events to focus fully on throwing events at local bars and meeting your needs. Project DC Events will concentrate on all those fun day time activities including bar crawls, live band performances, DJ shows, and so forth. Being party-goers ourselves we understand what it takes to have an unforgettable time. Project DC has over six years of experience planning and managing birthday parties, bachelor & bachelorette parties, corporate events, fundraisers, happy hours, and just fun nights out on the town. With the depth of our experience and our vast connections at your service, you can now sit back and relax while as we host your next event. Project DC is here to make sure you have the time of your life every time you are out. As a kick-off party to Project DC Events we will be throwing the much anticipated end of summer bar crawl “Summer Crawl DC 2012” on September 22nd. If you love the summer, drink specials, hanging out with friends, and meeting new people, then this is the perfect event for you. THOUSANDS OF PEOPLE, LOTS OF BARS! 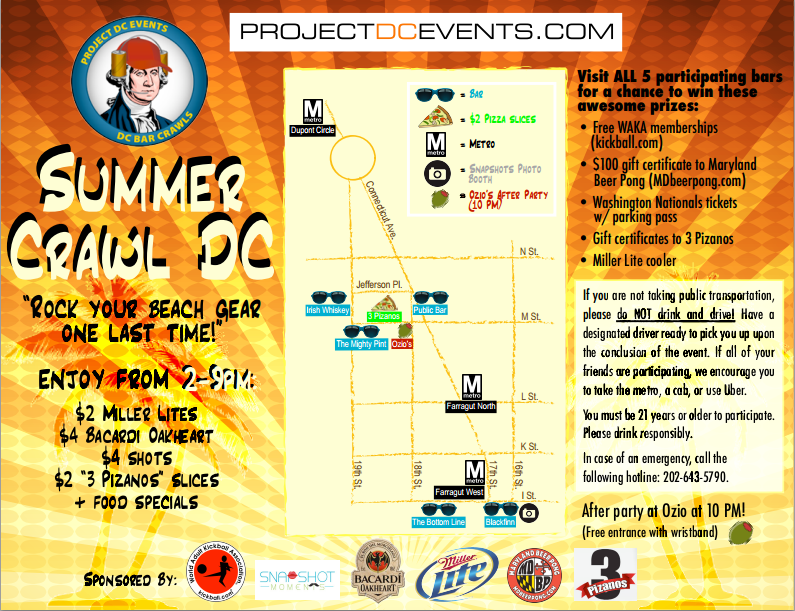 WASHINGTON, DC, August 10, 2012 – Project DC Events is excited to announce Summer Crawl DC 2012, scheduled for Saturday, September 22nd from 2:00 PM until 9:00 PM. The end of summer celebration will feature a number of bars in Dupont Circle and the Golden Triangle, including BlackFinn, Bottom Line, Irish Whiskey, Public Bar, and The Mighty Pint, with more bars being added weekly. After registering at BlackFinn to start the crawl, partygoers will enjoy free cover and exclusive drink specials at some of the hottest bars and nightclubs DC has to offer! Where are the best bars in DC? Are you looking for the best bars in DC? Washington DC may not have a nightlife scene on par with Miami or New York, but DC still has a lot to offer. With numerous universities, an increasing young professional population, political junkies and tourism, Washington will always have something for those looking for something to do. Because Washington DC is so diverse, there’s something for everyone! 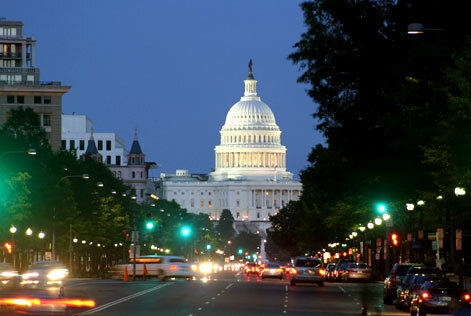 If you are looking for salsa dancing, dc happy hours, live bands, places to watch soccer, sing karaoke, or gay clubs, they are all a short cab ride or metro ride away! 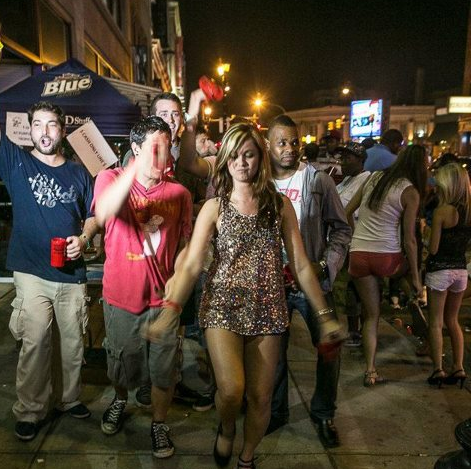 What is a bar crawl and how does one work? Bar crawl (noun) – A drinking session that moves from one licensed premises to the next, and so on. Bar crawl (verb) – To move in a group from one drinking establishment to the next, drinking at each. Many cities around the world host bar crawls that act as social gatherings for the community and tourists. These crawls focus on the social aspect of meeting new people, being introduced to new bars and clubs in a new city, and to promote the city itself.